The successful stage musical Ladies in Black is now on the big screen (not as a musical), directed by Bruce Beresford, known for Driving Miss Daisy and Mao's Last Dancer. Beresford has a knack for turning fairly dull sounding stories into interesting cinema. Driving Miss Daisy could have easily been a very mundane film, but Beresford managed to keep the viewer interested throughout, through very good character building and simple storytelling. 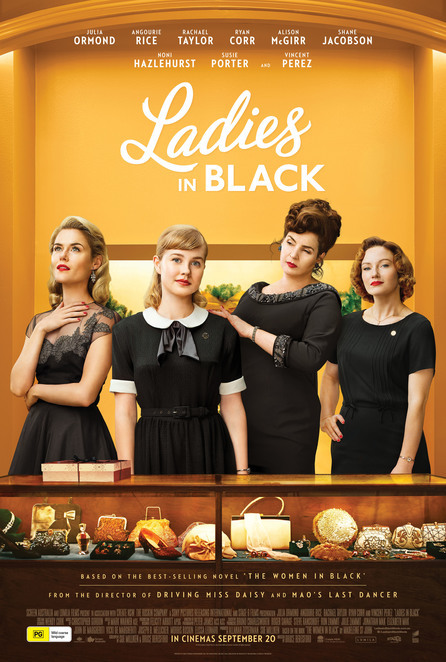 Ladies In Black is similarly driven by the characters and our interest in their lives, without the need for big drama or convoluted plot twists. The film follows the stories of a group of women who work at Goodes department store in Sydney over the Christmas period of 1959. Department stores were quite different in those days, clearly demonstrated by the piano player who serenades customers when the doors open to start the day. Using bright visuals, showcasing Sydney as a very sunny place to live (not my experience of Sydney, but hey, maybe we can blame that on climate change), This is a time of a cultural shift and moving out of the post-war conservative times into the vibrant sixties. Beresford uses a number of interesting effects to show 1959 Sydney (with trams included), and does a good job of capturing the time period whilst not restricting the setting to inside buildings or outside in basic locations that avoid showing the world around the characters. The woman of Goodes department store are made up of Lisa (Angourie Rice), a sixteen year old who has just finished high school and is making her way out into the real world for the first time, whilst she awaits her final exam results. She represents the innocents and naïve youthfulness of the story. She meets her work colleagues, Fay (Rachel Taylor), who whilst more worldly and experienced than Lisa, Fay is seeking much more exotic life experiences than traditional Australia is able to offer, especially when it comes to men. Patty (Alison McGirr) is a frustrated married woman whose husband is a bit of an oddball and struggles to communicate his feelings. Overall, Patty's storyline is probably the least successful within the film. Of course, we have to have someone to stir things up and bring change into people's lives, so we have Magda (Julia Ormond), an immigrant refugee who is disliked by most because of her posh ways and European manners. She, of course, takes Lisa under her wing and transforms her, but not quite like Audrey Hepburn in Sabrina. Ladies in Black doesn't fall into the trap of beating you over the head with Australian-isms. Sure, there is plenty of them, but they are much more naturally woven into the story than the disastrous film Swinging Safari from earlier in the year. There is also obligatory references to the pop culture of 1959, something period films often overdo. Thankfully, it was also not overpowering within the film. The story is very light, but it suits the tone of the film. The characters are interesting and likeable, with enough development to carry the story along to the end. It doesn't strive to be a big fanfare of Australian cinema, but rather a good honest film that should be viewed by anyone who enjoys light comedy-drama. The film focuses on the positive changes occurring in Australia in the late fifties, as new and diverse things began appearing around the country, as well as changes to social norms, mostly through immigration. However, the film stays clear of any deep study of racism during the period, with most of the responses to change being more of a cultural shock, resolved by simply tasting the new food or drink and shrugging one's shoulders. The cast is well lead by young Rice, who gives a strong performance as both a naive girl released into the world, as well as the smart determined character who is open to exploring new things. Julia Ormond brings Hollywood experience to the film and is very good as the world-wise match making Magda, and a source of much of the humour in the film. Shane Jacobson is also in the film, but of course, he is, he has to be in every Australian movie these days, having taken up the stalwart role left vacant by Bill Hunter. Ladies in Black will not have you laughing out loud consistently, but that's alright. It has an old-fashioned sense of humour and a lot of charm. The film reminded me somewhat of the film The Dish, which years ago I felt suffered from people expecting a film in the style of The Castle, but instead got a quaint story that focused on character and humour formed through natural situations. If The Dish was a film you enjoyed, then this film will certainly suit you (minus the world event of the moon landing as a backdrop). Go along and see it, because we need more Australian movies like this one.